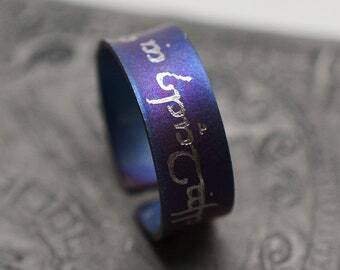 Announcement 2.4.2019: New etched rings added! Anodized titanium is already available, sterling silver & copper are coming soon! Current order processing time: 1-2 business days. I love creating custom items just for you -- if there is anything you see in my shop that you'd like a different metal or material, please just ask. I can do almost any piece in nearly any metal or stone available. I work with all forms of solid gold, sterling silver, and base metals like copper, bronze, steel, titanium, brass, and more. I gladly do bridesmaids jewelry sets and wedding jewelry. Contact me for more information / turnaround times / etc. Custom orders can be expedited on request. Please ask for more details! 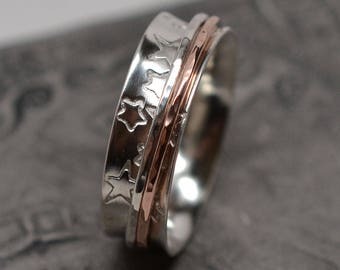 2.4.2019: New etched rings added! Anodized titanium is already available, sterling silver & copper are coming soon! New 1/4 inch spinner designs coming soon! Chainmaille -- from design to finished piece. Glass sheet, frit, and hand cut mosaic pieces of dichroic glass before fusing. Frequently used materials -- gemstones, jumprings, and a few finished pieces. ZS is short for "zerospace", the online handle I've used for years, and while many of my friends call me "Z", my first name is Amanda. I started out learning how to make necklaces with tiny glass seed beads when I was a little girl. I moved on to other kinds of beads and other types of jewelry-making, and often just enjoyed sifting through supply catalogs, dreaming of what I could make with each item. But, for as much as I loved jewelry & creating things, I also loved math, science, and computers -- and so by the time I reached high school, jewelry was mostly a forgotten hobby. 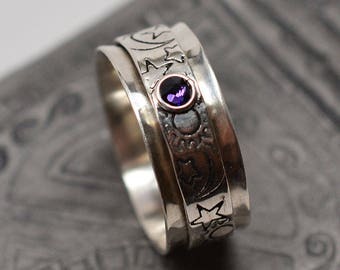 All through high school and college, computers were my hobby -- I'm also a web developer and designer today, and often work on both jewelry design projects and web projects simultaneously. After a long stint of neglecting my love for jewelry, instead focusing on applying my creativity to computer designs (e.g. I would "modify" a computer case much like some people work on cars or motorcycles), I finally got back to making jewelry in late 2006, but this time, I had a new focus. Beads took a back seat or perhaps a co-starring role alongside my new found love: chainmaille. A short while later, I took a class on fusing glass and began adding that to the mix. And after lots of prodding from friends and family, I went from being registered here on Etsy (since 2008) to finally opening my shop sometime in 2010. I now work in many mediums -- metal clay, polymer clay (any kind of clay, really -- I also throw pottery), chainmaille, beading, traditional pearl knotting, glass fusing, metalworking, etc. My desk is a myriad of supplies and tools, that I'm constantly re-organizing to make space for new tools. In a nutshell: I love creating wearable or useable art! Who says that scientists aren't creative? Welcome to ZS Art Jewelry! My work is a mixture of old and new--I love to combine traditional styles like knotted pearls and chainmaille with more contemporary fused glass pieces. While most of my work is wearable, some of it is functional too! Some of my items are one-of-a-kind -- meaning, I will never make it again. Each of these pieces is serial-numbered and comes with a certificate containing that number. This way, if you ever need your piece repaired, I will know exactly what materials I used originally. All non-custom/non-personalized items may be returned for a full refund (minus shipping) if return is initiated within 14 days of receipt, and the item is in NEW or ORIGINAL condition. Please contact me for return instructions. Items returned without authorization may be refused and returned to you. 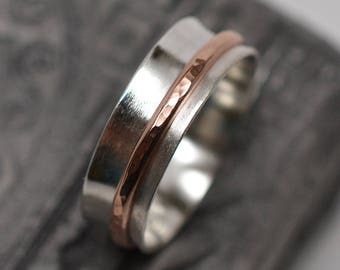 1) worn, dirty rings due to allergic reactions -- these are frequently caused by hand lotions, soaps and other skin products being trapped between your skin and the metal, especially copper and copper containing metals like brass, bronze, and even sterling silver. 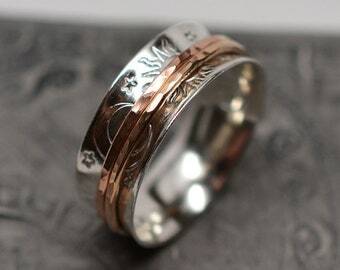 2) CUSTOM & PERSONALIZED items (this includes spinner rings with custom stamping). Items damaged in shipping can be returned for a full refund (photos of the damaged package may be required) or for repair/replacement. Please contact me to get a return/refund/repair started. Items lost in transit can be re-made (if not one-of-a-kind) and re-shipped. One of a kind items will be refunded if they are lost in transit (insurance claim can/will be filed in these cases). Most packages do not get lost, but some are delayed from time to time. Please allow plenty of time for a misdirected package to show up (this can be 2-3 weeks or more, depending on destination). I want you to be happy with your purchase, so if your item fails to meet your expectations (please have reasonable expectations, this is not mass-produced, machine-made jewelry), breaks, or something else happens, please contact me. Each case will be different, but I do ask that you give me the chance to make things right. I accept payments via Etsy Payments and PayPal. 1) Items that are not personal in nature (no special names, dates or other messages stamped, etc) or items that require no special ordered supplies to create will generally not require payment in full until the item is completed & photographed. 2) Items that are personalized with names, dates or in ways that make the item not suitable for resale should you change your mind AND items that require special ordered supplies to create will require payment in full prior to the item being created. Once paid for, these items are not returnable. I gladly accept cancellation requests made within 24 hours of ordering/payment. Requests made after this window will be at my discretion. As long as the item is not custom in nature (no special names or dates on the item) & has not shipped, cancellation requests will likely be honored even beyond the 24 hour window. I do NOT accept cancellations on custom orders once they are paid. I will give you many opportunities during the process of discussing a custom order to decide against continuing with it. Please choose carefully when you give the OK to proceed. I use the United States Postal Service for all shipments. INTERNATIONAL CUSTOMERS: Please note that I will not mark packages as a "gift" on customs forms. You are responsible for any/all customs fees/duties/import taxes, etc. Express (USA): 1 day, guaranteed. International delivery times vary widely. First Class typically arrives in 1-3 weeks to most destinations. Priority is a little faster. Please contact me if you have shipping related questions. I gladly do custom designs! Please contact me to discuss a custom item. For purposes of EU data protection law, I, Amanda Mizuno, am the data controller of your personal information. If you have any questions or concerns, you may contact me at zsartjewelry [!at] zero-space.net. I use a standard US ring size system. If you do not know your ring size, you may either be sized by a local jeweler or download a printable ring sizer just about anywhere on the internet that offers one that uses the United States ring size system. Contact me if you need a link to a printable ring sizer. I'm working on my own! My bracelets are all created and measured in inches. Each listing will explain in the description the best way to measure for the fit of that particular bracelet. Please read carefully! Bracelets can be re-sized if you do end up with an incorrect length, but it will require that you ship the bracelet back to me (at your expense). Please feel free to contact me if you have a specific question about a bracelet size. For any bracelet in my shop, you may provide me with a loose or snug wrist measurement and I will help you determine the correct size! Many of my items are made-to-order. While most will ship within 1-2 business days when I'm not busy, some require up to and over a week to create and be ready for shipping. Please click the "shipping & payments" tab to see the processing time for the item you want! I aim to keep those as accurate as possible! Most of my jewelry can be easily cared for by using commercial copper, brass, bronze, steel, and precious metal cleaners. If you dislike all those chemicals, you can also use a homemade cleaning solution made from vinegar and salt (followed by a short bath in a baking soda and water solution to neutralize the acidic vinegar). If you need detailed instructions on how to do this, ask me! Note: DO NOT use acidic cleaners on anything containing pearls! Most harder gemstones should be fine. No, I do not sell my jewelry wholesale currently. Where do you get your metals & gemstones, etc? All of my metals are either USA or Canada sourced unless otherwise specified. Plated materials may come from China. My gemstone beads come directly from dealers I meet at gem shows and occasionally online jewelry retailers. I try hard to record their country of origin whenever possible. The most common jewelry allergies are to metals like nickel and copper. If you know that you have a specific allergy and you wish to know if something contains your particular allergen, please contact me about the item before you buy! After a purchase, I can not be responsible for allergic reactions to my jewelry. They happen, and sometimes they happen even when someone has never reacted before. Rings & allergies: rings often cause skin reactions, sometimes because of polishing cloths, but also due to soaps, perfumes, lotions, and other chemicals found in water getting trapped between the ring band and your skin. My advice is when possible, please do not get your ring wet! 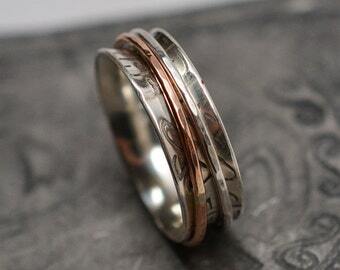 Are your spinner rings safe for children? No. 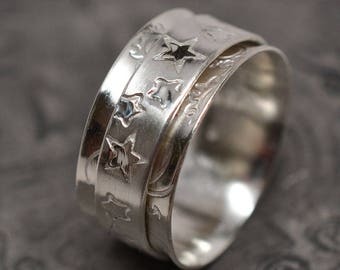 I do not recommend that anyone provide one of my spinner rings to a child under the age of 13. Teens should be fine. Especially the narrow spinner rings are a potential choking hazard for young children. They are not intended as a replacement for a fidget spinner toy for children.